Manveena Singh is known in the biz as a perfumer or nose. Outer Banks resident Manveena Singh has built an impressive career in the world of commercial scents, including perfumes. She shares Monahan’s concerns about the health effects of many perfumes and other scented products we apply to our skin. After a major change of course in her personal life, Singh is now trying to launch an FDA fully certified line of organic cosmetic products. And, our small population here on the Outer Banks plays a very important part in her strategy to change the way women (and men) think about these products. But time is running out. The question now is: ” Can her local friends and residents supply enough support through the concept of “crowdfunding” to take her product line ‘Manveena’s Solutions’ to the next level? Did you know certain ant species smell like coconut? The vast majority of us wouldn’t notice, but Singh can identify the scent with little effort. 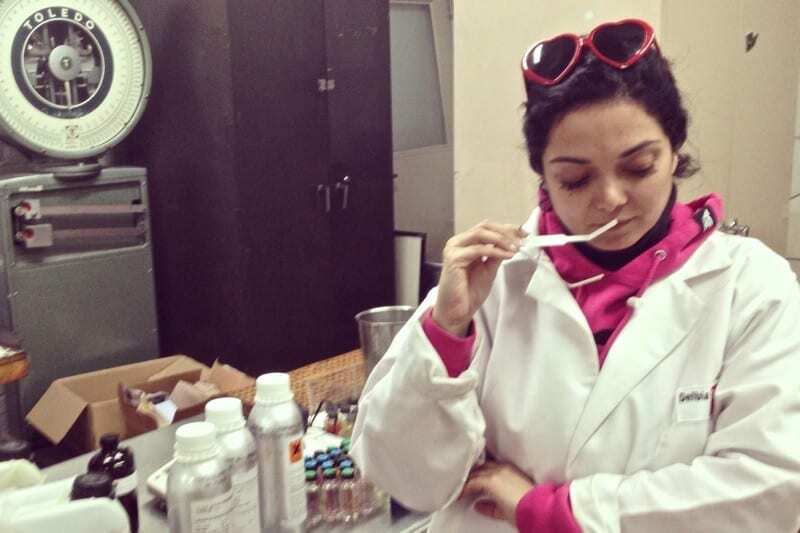 In the parlance of commercial scent production, Singh is known as a “perfumer” or a “nose” and she has spent a long time working with the scents that are a part of everything from perfume to body lotion to household cleaning products. She is a graduate of, and an adjunct professor, mentor and Advisory Board member at the Fashion Institute of Technology in New York City. At one point, her skill propelled her into a corporate career that made her responsible for $12 million of annual sales in the highly competitive world of scents. Raised in Chesapeake, VA., Singh spent time with her family on the Outer Banks. What is NOT in O.P.Y.N. Singh is convinced that synthetics are a significant contributor to the rise of cancers and allergies in modern societies, especially childhood allergies. “As a single mom, I don’t allow my daughter to wear commercial sunscreens and insect repellents because I know what’s in them,” she said. “I used to be part of the process that designed these products. Originally, Manveena’s Solutions was going to be a retirement project. Following a protracted divorce after 20 years of marriage, she lost nearly everything, her home, her car, her retirement, all of her savings and her business. In her early 40’s with a young daughter, she had to start over from nothing. Her goal is to model financial independence, do work she loves that contributes to society while maintaining her integrity and personal values; all under the watchful eye of her daughter and muse, Grace. “I am a disruptor and always have been,” she said. “I wanted to create an USDA certified organic line of skin, hair and body products and the corporate world of cosmetics is very slow, very traditional and risk averse,” she said. “I discussed the idea with colleagues, and they all said it would be too costly to use only certified organic raw materials and they are far too limiting for making a desirable finished product that works. When she was active in the industry, working with natural raw materials was her favorite activity. For her products, everything from geography to weather at the farms producing organic products, even “terroir,” a French term applied mostly to wine grapes, are factors. It describes how soil, local climate and geology can lead to distinct taste differences, in the same grape varietal, such as Merlot within an area as small as the same vineyard or as diverse as California versus France. Her first project was to go the lab and create her formulas. Next, she had to find an independent manufacturer that has USDA certification, a tough set of criteria to start with, and put her products through their paces. In her self-described role as a disruptor, Manveena is not going to market her product, at least initially, through the traditional networks of her former clients. She currently has her OPYN Pure Face Oil for sale on amazon.com in a beta test and is working with distributors in the Middle East to get her products on shelves. She is very interested in and in discussions with parties in China and India because there is such strong demand and so many consumers. Locally you can find her Pure Face oil at the Dragonfly Inn in Corolla, Island Acupuncture and Moms Sweet Shop in Kill Devil Hills. Her dream is that her “solutions” reach as many people as possible and has gone above and beyond to keep pricing accessible to most of the addressable population. Singh says her flagship product line — O.P.Y.N., Only Product You Need) — replaces an entire vanity full of other so-called specialty products. For example, OPYN Pure Face oil multitasks as a day/night moisturizer , eye-treatment, is anti-aging and lightens and removes dark spots. Close friends contributed money for her seed round to fund initial work on her products. She came close to wrangling a spot on ABC-TV’s “Shark Tank” making to all but the final cut. However, at the end of the month she will be interviewed by Women’s Wear Daily and she hopes the publicity will stoke demand for the product. Hence the need for inventory and the “crowdfunding” aspect so she has enough product ready for that demand–when it comes. Although this is an organic product, Singh is not targeting a counter-culture market. The question now is can the power of social media and viral marketing launch a product that could put the Outer Banks on an entirely new map—fashion and cosmetics. She needs $35,000 more to meet anticipated demand.